We are a family-­owned farm using sustainable practices to grow fresh produce in the fields and greenhouses on our 130 acre farm. 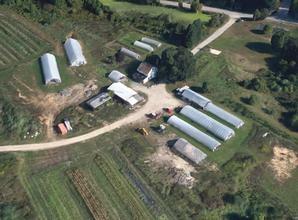 The farm is less than 3 miles from the center of Concord, NH near Route 89 and the Bow town line on Silk Farm Road. This land was owned by the Lewis family since 1930, In August 2016, James Meinecke and Becky McWilliams took over the Lewis Farm and committed to work as the next generation of family farmers on the farm. Our mission is to provide fresh, local, delicious vegetables and plants to people in the Greater Concord area, and also educate the public about farming. Lewis Farm is known for its Community Supported Agriculture program, Seasonal Farm Stand on the farm, and both pickup and delivery of our “Black Gold” compost and wood chips. It’s time for outdoor projects! Do you need compost, wood chips or topsoil for your next outdoor project?! Contact us to schedule a pickup or delivery of landscape materials. Did you know it can take up to 24 months to complete the transformation from leaves & twigs to our Black Gold Compost? Contributions of compostable material received in fall 2017 will be available in 2020! During that time we turn the wind-rows up to 16 times with our Mahindra. While we work with the NH DES on drafting food waste composting regulations, drop off of compostable household kitchen waste is free. We ask for a $5 donation to the farm for each residential load of material delivered. Contact James for our Frequent Contributor Program.